Abiotic and biotic processes associated with the degradation of a light petroleum in brines close to the salt-saturation (~31 %) and the effect of labile organic matter (LOM) supply (casaminoacids/citrate; 0.2 and 0.1 % w/v, respectively) were followed during an incubation of 30 days. After 4-week incubation at 40 °C under light/dark cycles, a 24 % of abiotic degradation was observed in untreated brines. The stimulation of native brines community with LOM addition allowed an additional 12.8 % oil attenuation due to biodegradation processes. Successional changes in the active microbial community structure due to the oil contamination (16S rRNA DGGE approach) showed the selection of one phylotype affiliated to Salinibacter and the disappearance of Haloquadratum walsbyi in untreated brines. 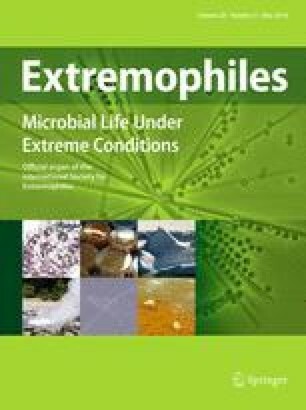 In LOM-amended microcosms, phylotypes related to Salinibacter, Haloarcula, Haloterrigena and Halorhabdus were selected. An effect of hydrocarbon contamination was only observed in the bacterial community with the inhibition of two dominant proteobacterial phylotypes. This study further confirms that short-term and moderate oil biodegradation is possible in LOM-stimulated brines. Biodegradation should be much more reduced under in situ conditions. Self-cleaning capacities of close to saturation hypersaline lakes appears, therefore very limited compared to non-extreme haline environments. The online version of this article (doi: 10.1007/s00792-016-0818-x) contains supplementary material, which is available to authorized users. The work was carried out as part of Yannick Corsellis’s PhD research, of Marc Krasovec’s master these and of the French National Program EC2CO BEMOL (Biodégradation des hydrocarbures dans les Écosystèmes hypersalés: Mythe Ou réaLité ?). We thank the Centre National de la Recherche Scientifique (CNRS) and the Institut National des Sciences de l’Univers (INSU) for financial support. Yannick Corsellis was granted a MERNT fellowship (Ministry of Education, Research and Technology, France). We thank the Salins Company for given us access to their hypersaline lake, Anne-Marie Abrard and Georges Argyris for the valuable help for the sampling period. We dedicate this paper to the memory of Michel Matra.